Throughout the course of each academic year, our student-athletes, coaches and administrators dive into a variety of training sessions, leadership opportunities and educational initiatives that are unique to our Jesuit roots and are culture driven. 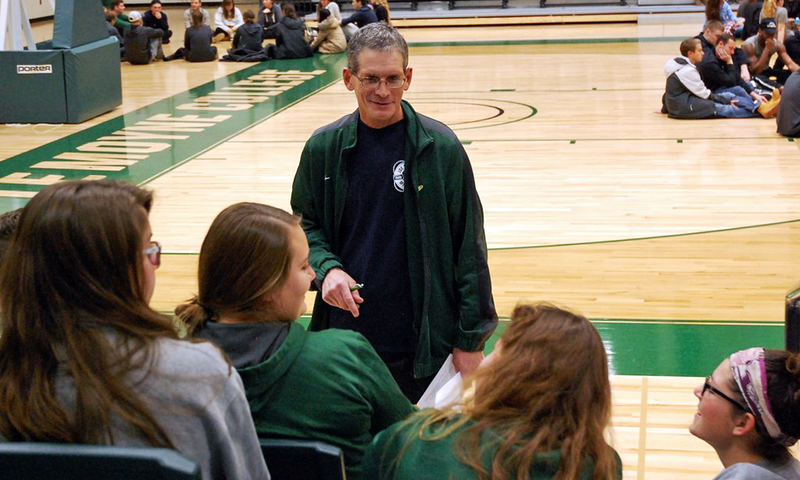 Whether it is a powerful reflection in the weekly Sunday Playbook, a peer-to-peer leadership activity at our leadership retreats or an inspirational message from a coach during a team push-in, our focus is to provide an enriching and transformational experience for our student-athletes. Through our continuous culture programming, we are committed to creating opportunities where individuals can develop into their 'best-self' - personally and professionally - and learn valuable life lessons that are carried with them even after they have crossed the stage at graduation. 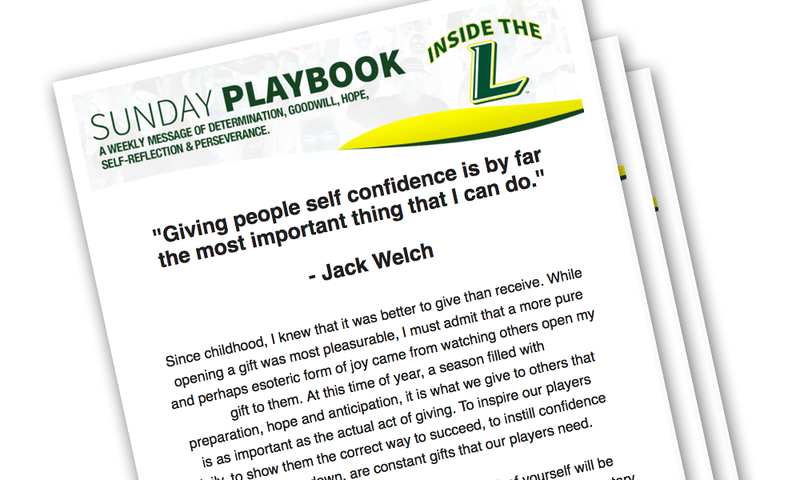 The Sunday Playbook is an inspirational piece that encompasses the core Jesuit values that are found "Inside the L" to connect with and motivate those within the Le Moyne community on a weekly basis. Consisting of a quote and a brief reflection, The Sunday Playbook aims to provide enlightenment, encouragement and inspiration to all who read it. Each Sunday, take a few moments to start your week by considering the message that is conveyed within each edition – a message of determination, goodwill, hope, self-reflection, perseverance, etc. Don't receive the Sunday Playbook yet? We have you covered. 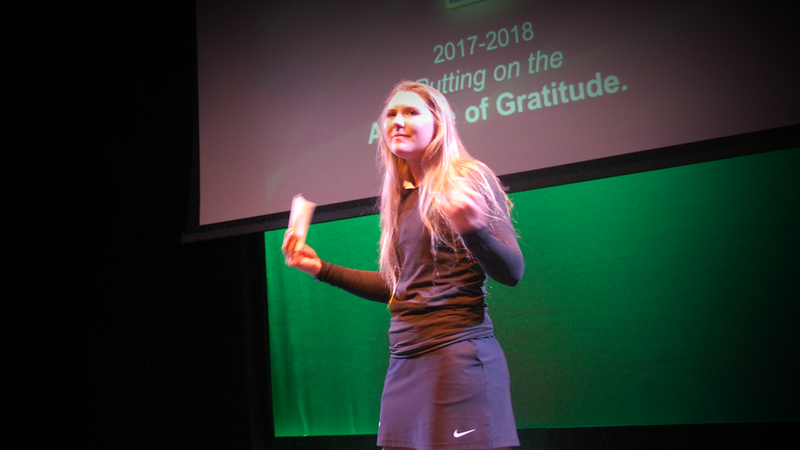 Sign up to receive inspirational messages from individuals within the Le Moyne Athletics community by clicking the button below! Twice a year, the entire athletic department (student-athletes, coaches, administrators, etc.) gather in the athletic center at 9:00pm to kick-off each semester. Through peer-to-peer led whole group and small group discussions and guest speakers/presentations, Inside The L core values, performance indicators, themes, stories and goals for the current academic year are shared and discussed. Freshmen - Inside The L history and overview; getting acclimated to campus life; time management, the importance of academic, athletic and social life balance, prioritizing and other life skills; leadership roles as a rising sophomore and how to assist incoming freshmen the following year. Sophomores - Inside The L review; assisting freshmen with college transition; the importance of academic, athletic and social life balance; preparation for upperclassmen role and potential leadership positions in the following year. Juniors - Brief Inside The L review; professional preparation; providing guidance to sophomores who will assume upperclassmen roles in the future; characteristics of leading self and others. Seniors - Reflection of personal growth and transformation; professional preparation, prepare juniors to assume senior roles on campus; characteristics of leading self and others; Inside The L insights and lessons learned for life after college. Twice a year, coaches are paired with different teams where they spend 5-10 minutes speaking about how they practice the Inside The L core values and themes within their own team. Whether it is by celebrating 'Grateful Fridays', meditating before games or simply reading the Sunday Playbook each week before practice, coaches and student-athletes are encouraged to creatively align Inside The L practices within their team structure. In the Fall and the Spring semesters, student-athletes have the opportunity to attend an overnight retreat that incorporates our Jesuit values and themes in targeted leadership training and development. Through interactive small-group activities, whole-group discussion and personal reflection, we strive to sharpen leadership characteristics across all levels - individually, in a team-setting, in the Le Moyne community and in the world. 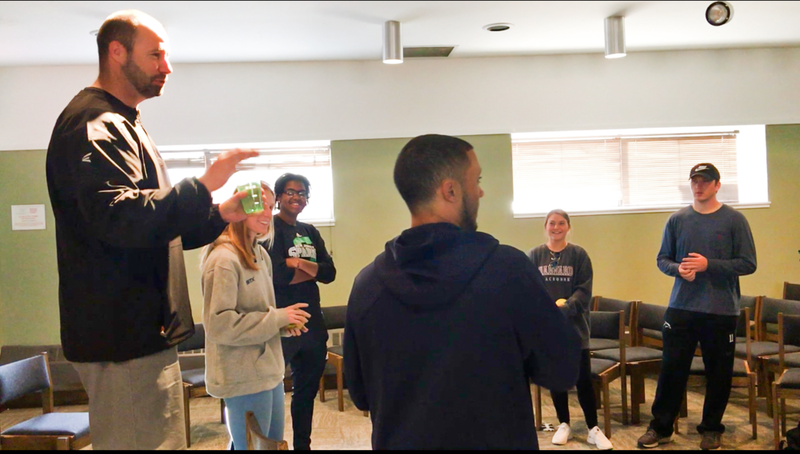 Check out this short video from one of our previous leadership retreats as our student-athletes participated in "The Tallest Tower" activity. The goal was to effectively and efficiently use communication and teamwork skills to build the tallest free-standing tower with only the supplies given. Each group had different amounts of supplies to symbolize life and the different talents and opportunities that each individual will have. Some of the lessons learned from this activity were to not judge or compare your life against someone else's, be grateful for what you've been given and maxime your talents to make the most of them. There were 3 groups, but only one tower was the tallest. Which tallest tower was left standing? Check it out below! Multiple times throughout each semester, athletic department head coaches and administrators meet in the morning to participate in Inside The L facilitator training sessions. These sessions are aimed at promoting a sharing of ideas, enhancing knowledge of our core values and themes and providing training on how to lead future activities in a team-setting or at department functions that our student-athletes will be participating in. 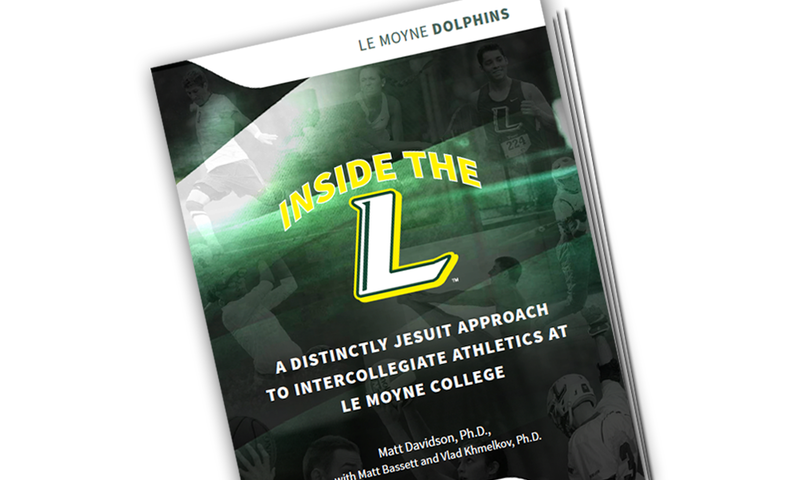 In the beginning of each academic year, all freshmen parents are invited to the Inside The L Parent Orientation where they are welcomed to the Le Moyne Athletic family. From the voices of current coaches, student-athletes, administrators and parents, the freshmen parents are provided an introductory overview of what Inside The L is all about and what they can expect their children to experience during their time with the athletic department on the Heights. Men's lacrosse head coach, Dan Sheehan, shares a personal narrative about his experience with the intentional shared culture of the Inside The L program.